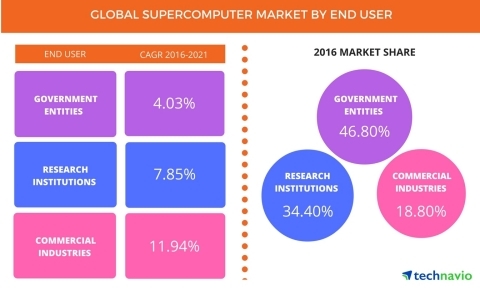 According to the latest market study released by Technavio, the global supercomputer market is expected to reach USD 4.95 billion by 2021, growing at a CAGR of 7%. This research report titled ‘Global Supercomputer Market 2017-2021’ provides an in-depth analysis of the market in terms of revenue and emerging market trends. To calculate the market size, Technavio considers the installation and sale of supercomputer systems from end-users like government entities, research institution, and commercial industries. Supercomputers are being rapidly adopted by research and academic institutions, as well as a number of industries such as energy, oil and gas, manufacturing, and others to help improve product offerings in terms of reliability and robustness. Many vendors are also aiming to offer converged, high-performance technology solutions. This trend, which is growing significantly, will drive the market growth during the forecast period. Governments worldwide are recognizing the need for supercomputers due to the growing importance of economic competitiveness and security, which are key concern areas for a nation. They are also using such systems to develop advanced defense systems and electronic warfare tools. The US government to compete with China in terms of the fastest supercomputers, coordinated a federal strategy in 2015 for HPC research, development, and deployment. Research institutions, both government-aided and private, have been using supercomputers for the longest period. Space agencies have been using such systems to study and understand the complexities of the universe by creating simulated models based on complex calculations and assumptions. CERN, the European Organization for Nuclear Research, operates the largest particle physics laboratory in the world and undertakes extensive research in the field of particle physics such as the recent creation of a black hole environment in the lab. Also, leading universities use supercomputers to carry out research projects in fields such as biotechnology and engineering. The data processing in genetics involves thousands of factors which have to be processed, in such a situation supercomputers are the best choice. The commercial industries segment is lagging behind government entities and research institutions in terms of the adoption and use of supercomputers. Initially, only large enterprises such as Tata Group had resources to purchase supercomputing systems. The company had installed its first supercomputer Eka in 2007. However, market players brought these systems within reach of SMEs by developing mid-sized and small supercomputers. “Enterprises are also collaborating with government entities. For instance, companies in the US can make use of investments and expertise in supercomputers through programs operated by some of the nation's NSF-funded universities and Department of Energy laboratories,” says Chetan. Become a Technavio Insights member and access all three of these reports for a fraction of their original cost. As a Technavio Insights member, you will have immediate access to new reports as they’re published in addition to all 6,000+ existing reports covering segments like computing devices, displays, and lighting. This subscription nets you thousands in savings, while staying connected to Technavio’s constant transforming research library, helping you make informed business decisions more efficiently.